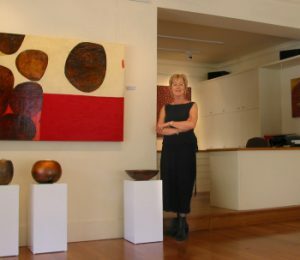 The philosophy of the gallery is to exhibit high quality artworks by contemporary Australian and International artists who have solid and growing reputations in the art world. With this aim in mind, Salmon Galleries selects original paintings, etchings, sculpture and ceramics by a range of talented people whose artworks promise the collector, lifestyle and long term financial enrichment. Our exhibition policy ensures that private and corporate collectors can be confident that the artists represented have already attained a position of renown in the contemporary, Australian art world, or are committed to securing that status in the future. The gallery provides a complete service to our clients – some of which are described on this website. For more details, please feel free to call and see us or Contact Us. With an academic background in art history and theory, and ten years experience in the arts industry, gallery director Judith Salmon is committed to promoting an informed appreciation for modern Australian art, including contemporary Aboriginal art. At Salmon Galleries we hold regular and changing exhibitions of paintings, sculpture and works on paper. To support these exhibitions, Salmon Galleries has a free ‘After Hours’ program of talks and social events on a range of art-related subjects such as Printmaking, Mixed Media Art Practice, Art Collecting and aspects of Australian Art History. Judith is assisted at the gallery by Anna Harpley, a practicing sculptor with tertiary qualifications in the visual arts. Incorporated in the gallery is Still Lives, an art bookshop that specialises in books about influential and contemporary artists, art movements, practice and theory. The bookshop also carries titles on Aboriginal art that support the paintings and works on paper exhibited in the gallery. A personalised and professional framing service is also available. Trained assistants are available to advise on sympathetic framing for artworks including hand-gilding and painted finishes. Salmon Galleries also offers a complete Art & Interiors consultancy service for the office and home. Services include colour and design consultancy, full project supervision, sourcing of exclusive furniture and a coordinated picture hanging service. Beginning and building upon an art collection is a lot of fun and can also be financially rewarding. Many collectors today are looking for artworks they want to live with now and profit from later on. Please click here for more information. 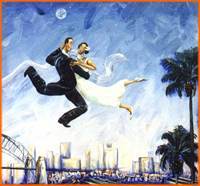 ‘A Time to Dance’ – Karen AtkinsThe gift of a painting or sculpture is a way of sharing the unique pleasure of surrounding ourselves with beautiful and original artworks. Salmon Galleries’ experienced staff can help advise on the compilation of a gift list for those discerning couples interested in beginning an art collection or wishing to build on an existing one. The service includes complimentary gift wrapping and a handmade card with every art purchase. We are delighted to assist in group purchases and the Gallery can arrange safe and speedy delivery to any destination in Australia or overseas. Salmon Galleries is a spacious building located at 71 Union Street, McMahons Point on the corner of Thomas Street. The gallery is within easy walking distance of the North Sydney business district and just five minutes from the railway station. Union Street runs off Blues Point Road, the café and restaurant mecca of the lower North Shore. By car, we can be reached from the City via the first exit off the Harbour Bridge (Lavender Street turns into Union Street). Artworks can be freighted to anywhere in the world. Freight, Handling and Insurance are not included in price of artwork. All listed prices are quoted in Australian Dollars. Listed prices generally include frames. Most paintings can be purchased unframed. Salmon Galleries accepts American Express, Diners Club, Bankcard, Mastercard, Visa and eftpos.